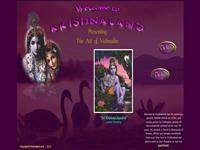 A website which contains the paintings, posters, limited edition art prints, and canvas giclees by Vishnudas, painter of transcendental spiritual art for over 35 years. His artwork is found in thousands of homes, offices and temples worldwide. Category Art and Artists May 24, 2012 by ISKCON Desire Tree.